View of the Caribbean Sea. Santo Domingo is the capital and largest city in the Dominican Republic and the largest city in the Caribbean by population boasting 3.9 million including the metropolitan area. The city’s harbor at the mouth of the Ozama River accommodates heavy passenger and freight traffic making it the countries chief seaport. Tourism is one of the largest industries of the island. Sports outreach in Coral de Sur. 25 teenagers gave their lives to Christ following a basketball game. Contrasting the beautiful landscapes and beaches, Santo Domingo is being crippled by many social issues. Unemployment rate is at 15%, HIV prevalence is at 7% (Haiti and the Dominican combined have the most HIV cases in the Caribbean), 200,000 orphans, 41% living below the poverty line, and prostitution is literally everywhere. Historically Catholicism dominated it’s religious practices, but lately, protestantism and non-christian groups have experienced a population boom. 18.2 percent are considered to be evangelical protestant. churches are typically more focused on self preservation and the past than forward focused evangelism and discipleship. The dominican is home to one of the most famous baseball players in Cubs history; Sammy Sosa. Baseball and basketball are, by far, the most popular sports in the dominican. In each culture, there are activities that transcend social, political, and religious divides. Sports is paramount in the Dominican. 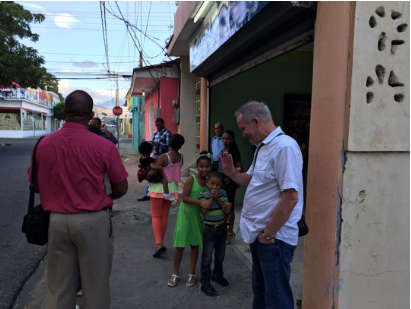 Kenneth is currently working with two churches to increase their effectiveness in local outreach, discipleship, and missions. He has organized several relief teams from the dominican to serve in Haiti following the earthquake of 2010. He is also planning youth camps, marriage conferences, pastors conferences and many more sports outreach initiatives in 2016. His team consists of young men and women who have been reached through the ministry. Wilkin Mercedes is a young lawyer who was mormon until he heard a clear presentation of the gospel following a basketball outreach that he was invited to play in organized by Kenneth. He now serves with Kenneth as a discipler and translator. 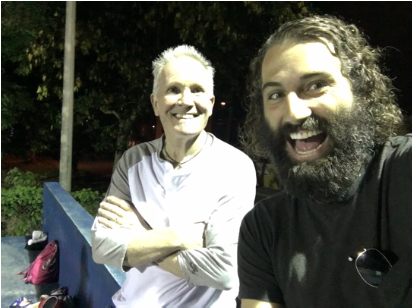 Kenneth is clearly a man of peace, has connections in the Santo Domingo political scene and has a massive heart for evangelism, discipleship and the local church. Saturday and Sunday we spent the day with Kenneth, Wilkin, and one of their closest friends Pastor Rophonsys Reyes. Rophansys leads Grace Chrisitian Church in Bani which is about 40 minutes south west of Santo Domingo. He started his church in his home with about 10 people a year and half ago and now runs a weekly attendance of about 175 people. There are a few things that stand out about him and his church. During the Sunday evening service there were 30 new visitors, many of which accepted Christ of the first time. Weekly Awana ministry reaches out to children and youth and they also have a weekly bible study for adults. When I asked how many attend these events during the week he replied, everyone! It seems that every time this church “opens it’s doors” everyone, and then some, show up. He attributes the health and growth of his church to an intense focus on prayer and discipleship which Kenneth has been instrumental in shaping. I asked Kenneth what sets this church a part from others. He told me that it is alive. I was impressed by the fact that Rophonsys was recently offered and declined a paid position overseeing the discipleship of 40 churches. He said that when pastors are paid, they lose sight of the mission of what a church is supposed to be. He receives a meager $200 per month from his church and runs and empanada (which are delectable) business out of his home to supplement. He has never been more excited about what God is calling him to do. I see many opportunities here for the future if God permits. Grace Christian Church is and independent, non-denominational church which would be a great candidate for international campusing. It’s also an ideal place for teams, namely sports and medical because it is close and readily exposes westerners to abject poverty and the impact that evangelism and discipleship can have. I truly believe that Kenneth, Rophonsys, and Wilkin are men of peace. Thanks for the opportunity to discover God’s activity all over the world. Sunday evening service. Roughly 100 in attendance with 30 new visitors. Basketball outreach in Coral de Sur. Kenneth’s ministry organizes events like this every month and wants to grow it’s impact. Kelly with congregants of Grace Christian Church before the Sunday night service.